One of my favorite car events of the Summer has to be the big vintage race weekend at Road America in Elkhart Lake, Wisconsin each July and one of my favorite cars is a Porsche 356. There was a time when I’d attend all three vintage events at Road America each year. When I lived in Chicago I’d go up for the SVRA weekend in May, the big July event and the Fall Festival in September. Now that the track is 6 to 8 hours away (6 if driving a modern car via the fastest possible route, 8 if driving a vintage car over the winding back roads… also, as fast as possible) I usually just attend the July event. Mark was all smiles the day we picked up his ‘new’ 1964 356 SC. 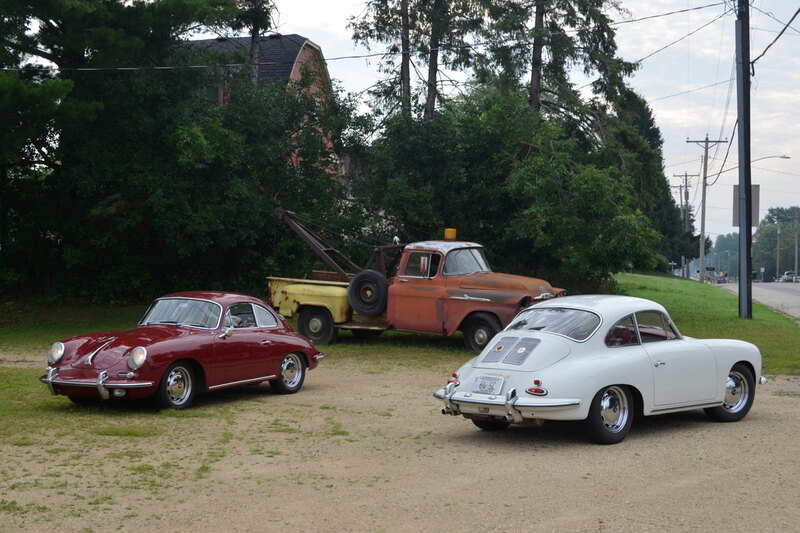 The plan was to drive his 1965 Porsche 356 C, in Ruby Red, down to Northfield, MN from his house in Stillwater, MN to pick up a white 1964 356 SC he had just purchased from its longtime owner. Any way you look at it, I was going to get to drive a 356 for a couple of hours, so what the heck… ‘Yeah, I’ll go.’ As if I needed to spend another few hours in an old car the day AFTER the Walleye 1000 weekend, but this is what car guys do, for other car guys and to feed their addiction. I went to bed that evening knowing where my next ‘cool old car fix’ was going to come from. 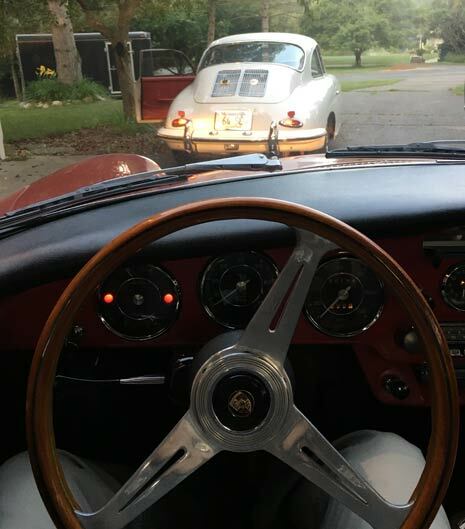 So… long story short, it’s July, Mark has two 356s, as much as he’d probably love to keep them both, space, time, and whatever other factors there are, led him to another conclusion. Thankfully, again, he called on me, the suckerest sucker he probably knows when it comes to old cars. “Hey Dave, I’m ready to put Ruby on the market and I was thinking we should drive both 356s down to Elkhart Lake for the vintage races. You can drive Ruby and we’ll park her downtown each night and at the track during the day with a ‘for sale’ sign in the windshield, I’ll drive the white car and we can take the back roads.” I don’t think I answered immediately, holding the phone to my ear I thought, ‘This has GOT TO BE the best idea Mark has ever had’ – I answered right away. 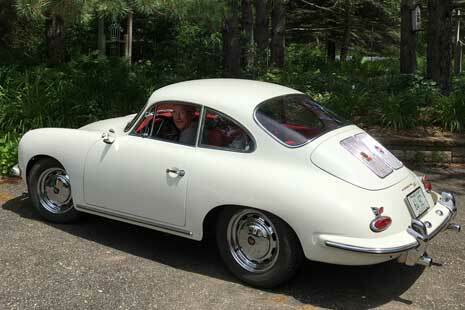 “Wow, that sounds great, some real windshield time in a 356!” We planned the weekend. I’d drive from St. Louis Park to arrive at his place in Stillwater so we could leave on Friday morning by 6:00am. Mark would figure out the route, something more fun than just taking WI 10 the whole way across Wisconsin, he’s good at this. The day came, I was up at the crack of dawn, before dawn actually, and on my way to Stillwater. When I arrived Mark, always the consummate vintage Porsche guy, was in the driveway with both cars idling to bring oil temperatures up to spec before setting off, checking the cars over one last time. 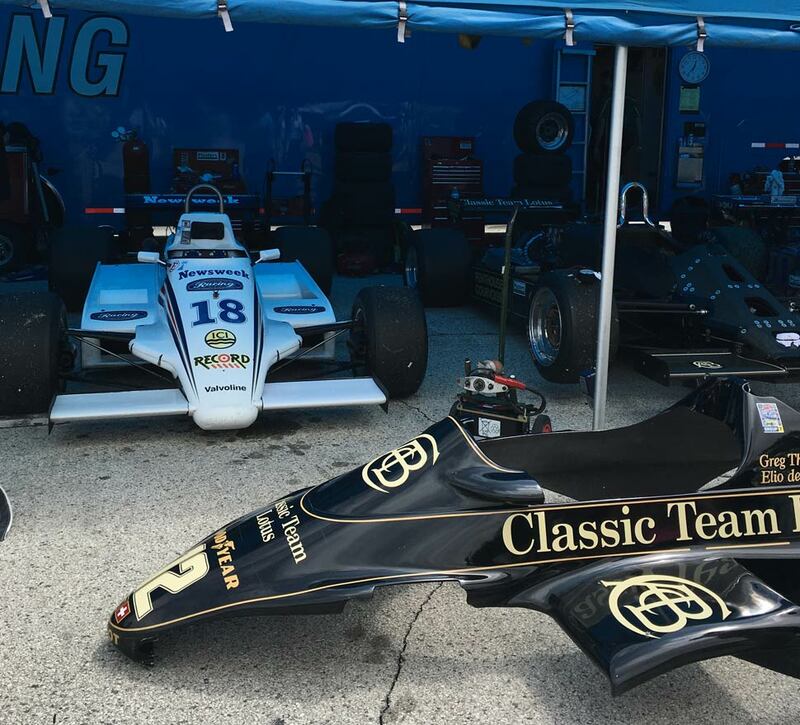 We knew we were going to attend this vintage race weekend months ago. I bought us a camping pass for the Carousel campground back in January. 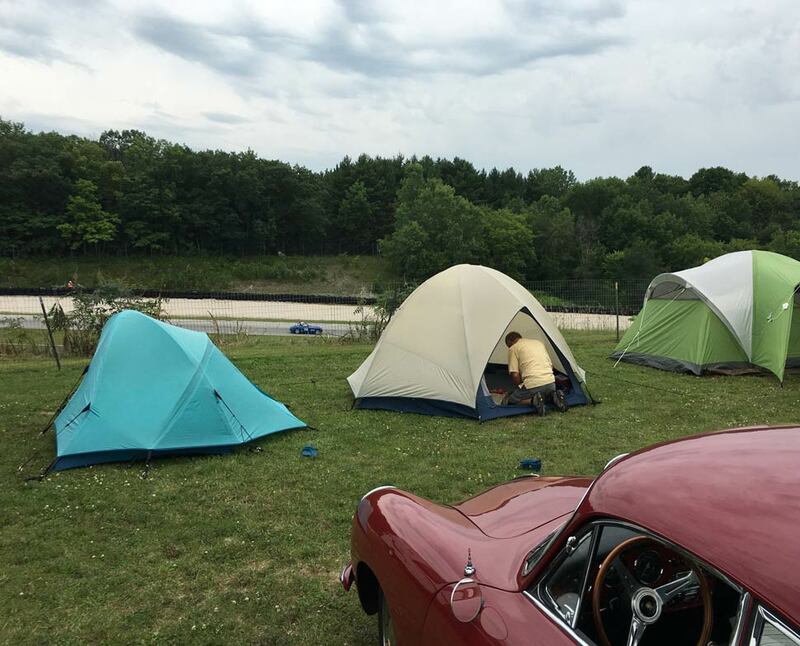 After years of staying in hotels in and around Elkhart Lake and renting houses with groups of friends, I decided it was time to return to my SCCA course worker roots, that means camping in the Carousel. I’ve been an SCCA course worker at various tracks around the Midwest, and camping was always a part of that. As I packed the car I realized that there is a surprising amount of room in a 356, enough room for a cooler, sleeping bag, ground pad an overnight bag with room for a folding chair under the front hood, with some room to spare. I settled into Ruby’s driver’s seat, it was such a natural seating position, and comfortable. My hands fell right at 10 and 2 on the wheel, a slight bend in each elbow. We pulled out of the driveway and headed south, Mark led the way in his white SC. The back of the white car would be a regular view for me for the rest of the weekend, just like the Walleye 1000, Mark mapped out our route to Elkhart Lake in such a way as to maximize fun while still providing decent lunch and gas options. Getting comfortable behind the wheel of Ruby before setting off to Elkhart Lake. The view of the back of the white SC would be a regular one for me during the course of the weekend. We always travel with Motorola walkie-talkies for en-route communication. We point out interesting cars on the side of the road and compare notes as to how the cars are behaving or we just talk and joke around. We stop often, usually, to take a photo next to something interesting. Anyone who has ever said ‘It’s just a hopped up Volkswagen’ about a Porsche 356 doesn’t know what they’re talking about. To me, a Porsche 356 feels a lot more like a 911 than a VW beetle. This red car is fast and sure footed. I could take my hands off the wheel at 65 mph and it would stay perfectly smooth, going straight down the road. The time came to pass a car on the two lane Wisconsin back roads, I dropped it into 3rd gear, the rpms flipped up to about 5,500 and into the oncoming lane I went. As I pulled in front of the car that had been in front of me… now in front of it, I looked down to see that I was doing 95 mph, comfortably, in 3rd gear. Sure, it was a little loud at that point, windows down, all the vent windows open, but it was no Volkswagen, that’s for sure. This car was an absolute pleasure to drive. Well behaved and predictable, I loved every minute of it. The only real goal was to get to Elkhart Lake sometime in the mid-afternoon. Friday night in downtown Elkhart Lake this weekend is especially fun. The race cars drive from the track, up highway 67 and right into downtown Elkhart Lake where they park for a race car Concours sponsored by Road & Track. It was cloudy for most of the afternoon and it looked like it could rain on us at any time so we drove straight to the track to find our campsite and pitch our tents. Friday afternoon practice was going on as we set up our tents, the big open wheel cars were on track when we pulled up to the fence along the Carousel turn, vintage Formula 1 cars, combined with Formula 5000 and Formula Atlantics, a fast, loud group… a nice introduction to race engines for the weekend. Once camp was set up, we headed into town for an early dinner. Cars go around the Carousel as we pitch our tents. Despite the fact we got into town several hours before the race cars were to arrive from the track, any prominent parking spots to display Ruby, our car for sale, were long gone. Not to worry, there may not be a bad place to park a car for sale, as everyone walking around is a car enthusiast, and she still drew onlookers and sign readers in her out of the way spot. Mark had put together a little stat sheet on the car and had a copy of the Porsche Certificate of Authenticity to put inside the windshield with printed flyers for outside the windshield. 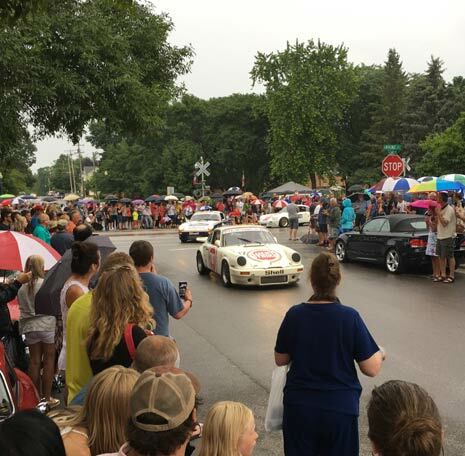 Vintage race cars stream into downtown Elkhart Lake for the race car Concours Friday night. We had dinner with some car friends from the Twin Cities, Paul and Chris Bergquist from the Mercedes-Benz Club and some friends of theirs, Darrell and Maureen Sykes, past Mercedes Club members. Darrell hadn’t been to Elkhart Lake since the early seventies, Paul convinced him to go after he returned from just as long a period of time away from the track last year. After dinner, we walked outside and the race cars started arriving, it also started to rain. It was the first time I can remember, in 15+ years, that it rained on Friday night. It hardly affected the turnout, the place was packed, wall to wall people, oogling race cars, eating, drinking, it’s a huge street party, the streets just happen to be lined with millions of dollars worth of vintage race cars. After a few hours of socializing and running into old friends, many that I only see during this weekend each year, it was back to the track, to our tents for the evening. We went to bed early, as we knew we wanted to be up early. In the morning we drove, in one car this time, downtown to a little diner for a good breakfast then it was back to the track to watch the on track action. We walked along the track, through the trees along the straight away between turns 3 and 5. Road America really is like a nature preserve with a race track running through it. You don’t sit in grand stands working on your sunburn all day, no, not at all. You are free to walk around, find a nice shade tree and go from turn to turn, always seeing the cars from a different angle, seeing them coming and going from different directions. Around lunch time Mark and I went our separate ways, he headed downtown for a Porsche 356 Registry get together, I walked through the acres and acres of paddock space. This event usually draws between 400 and 500 cars which makes for a lot of cars to see, a lot of trailers, a lot of paddock space. Adam warms up the motor of his father’s vintage Camaro before it takes to the track. I knew I wanted to stop by to see a few local Twin Cities folks, this year, I was able to find everyone I was looking for, and even some folks I wasn’t looking for. I tracked down Adam Karon, one of the guys from Morrie’s who has come on the Walleye 1000 Vintage Rally the past two years. His father races a 1968 Camaro SS. I found Adam sitting in the driver’s seat of his father’s car, getting it started and warmed up for the race, as his group was coming up a few minutes after I stumbled along his paddock space. Not too far past their spot was where Ben Robertaccio, also a Morrie’s employee, was set up. 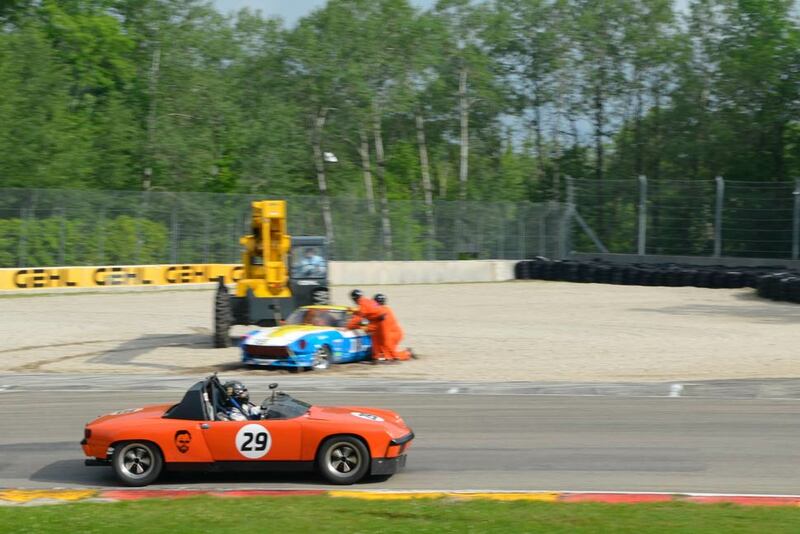 Ben races a very cool Porsche 914-6. It’s great fun to see these guys at the track. As I was making my way back towards the other end of the paved paddock, hundreds of yards of hot asphalt, I was getting a little warm. I’m pretty sensitive to the heat after getting heat stroke in California a few years ago. I was getting uncomfortably hot just as I made it to a concession stand where I got another cold bottle of water. I found a seat under a shade tree and was relaxing when my phone rang. It was the father and son team of Chris and Alex Georgacas from Mahtomedi. I first met these two on a Mercedes Club event I put a bunch of time into planning, almost 10 years ago, for this same vintage race weekend. I put flyers together, sent out emails and tried to get people to sign up for the Mercedes Club ‘Convoy to Road America’ for the vintage races, they were the only two people that showed. At the time I was really annoyed that only two people, besides me, showed up for an event I tried so hard to plan, but it was then that I learned… it doesn’t matter who doesn’t show up, it matters who DOES show up, have fun with those people, the rest are just missing out. I think they’ve come on 4 of the 6 Walleye 1000 events by now too, we see a lot of each other, they’ve become great car friends. They have a very cool, and rare 1984 Mercedes-Benz 500 SEC 6.0 liter 4 cam AMG Coupe… you know, one of those cars someone bought in the 80s for $80,000 and then spent another $175,000 having AMG modify. They’ve got one, completely documented with all the period records and receipts. It’s such a special car that the Mercedes-Benz Classic Center in Irvine, CA contacted them earlier this year and asked if they would loan it to them to put on display at Pebble Beach this year… this coming week! How cool is that? Have fun out there boys! “I’m right by the St. John the Baptist concession stand in the paddock” All the concession stands at Road America are run by local community groups, churches, Kiwanis, etc. The Georgacas boys save me from certain heat stroke (this photo was taken at the 2016 event, but I’m using it here… same guys, same car, you get the idea). I really was feeling overheated, like I needed to get out of the sun and into somewhere cool, and fast. 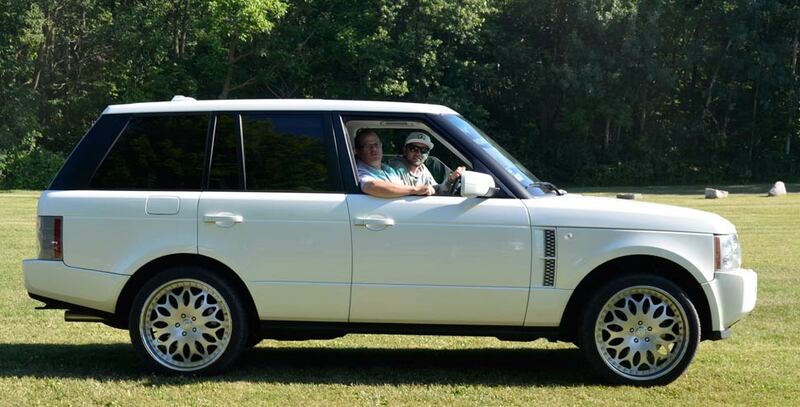 As usual, Alex is cool… in style and temperature… just out of college, his whole life ahead of him, there he was, behind the wheel of a big white Range Rover. I knew it would be plenty cool in there. 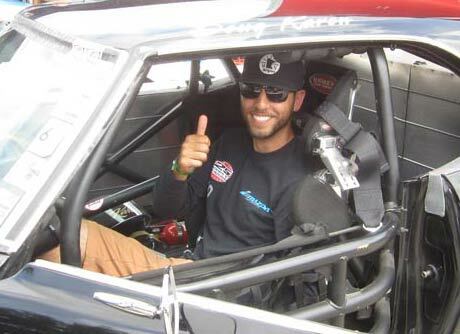 His father, Chris, was in the passenger’s seat, along for the ride. I climbed up into the back seat and the A/C hit me like an arctic blast. “Ahhhhh, this is perfect, I was getting too hot out there” I said with relief. “You want a water? Open up that cooler, we’ve got plenty” Chris pointed to the cooler. We spent the next couple of hours driving to various vantage points around the track, talking about cars, their upcoming trip to Pebble Beach, their first to Monterey Car Week. It was a great time. As late afternoon arrived the guys dropped me off at our campsite where I met back up with Mark. We drove Ruby into downtown Elkhart Lake, this time, we got a great parking spot. Anyone who entered the main downtown area got a good look and the stream of traffic was steady, people looking at the car. Mark stood close by, sure to answer any questions people had. People are just drawn to 356s, men, women, kids, 356s just seem to put a smile on people’s faces. We had dinner, strolled around and looked at the cars in the show. We met up with Russell and Andrea King, friends from North Oaks. Last year they brought their 1963 Maserati 3500 GTi for the Saturday night concours, you may have seen it at the Intermarque Spring Kick Off this past Spring. Well, this Summer, they brought a mid 70s Chevrolet C10 pick up truck that was originally purchased by Andrea’s grandfather, then given to her father and then to her. Over the past couple of years they restored this truck, from a rusty hulk sitting out in a field on the family farm to a pristine, better than new (seriously, over the top) truck. Not really what you’d expect to see at a sports car event, but the quality of this piece was, frankly, much higher than a lot of cars in the show. As usual, Russell and Andrea dressed to match their vehicle… Russell in Overalls and a cowboy hat and Andrea in cowgirl boots and a country style dress. Those two certainly do to have fun, wherever they go. We eventually made our way back to the track. Mark and I were in our tents just after the sun went down, again, early to bed, early to rise. We wanted to park the cars somewhere in the paddock for maximum exposure for Ruby on Sunday, so we knew we needed to get up early. I woke up about midnight to the sound of rain hitting my tent and thunder. I grabbed my phone and had a look at the weather radar to see what this was all about. The radar showed a huge red blob headed right towards us… it was going to be big and it wasn’t’ going to be brief. Over the next few minutes the rain really started coming down, then it started POURING, you know, that kind of rain like, it couldn’t possibly rain any harder? Then the wind started, my tent was whipping back and forth, the fiberglass poles were flexing back and forth, it was serious stuff. Click here to read Part II of this article! 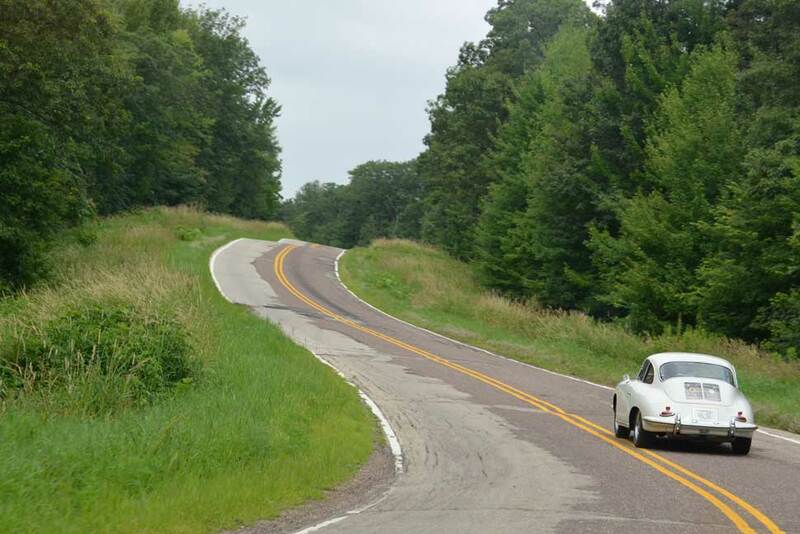 Following Mark in the Ivory 1964 356 SC over the winding back roads of Wisconsin. Vintage Formula 1 cars in the paddock. At Road America a regular ticket gives you unrestricted access to the paddock. 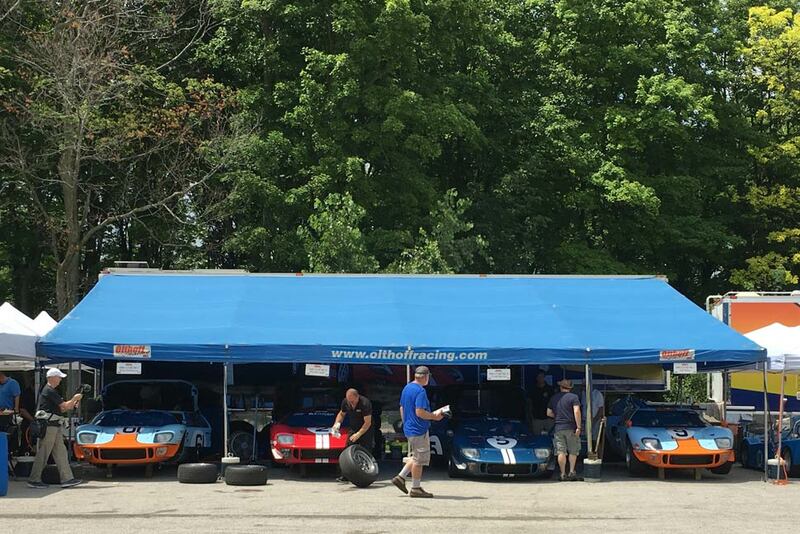 A nice group of Ford GT40s in the paddock. 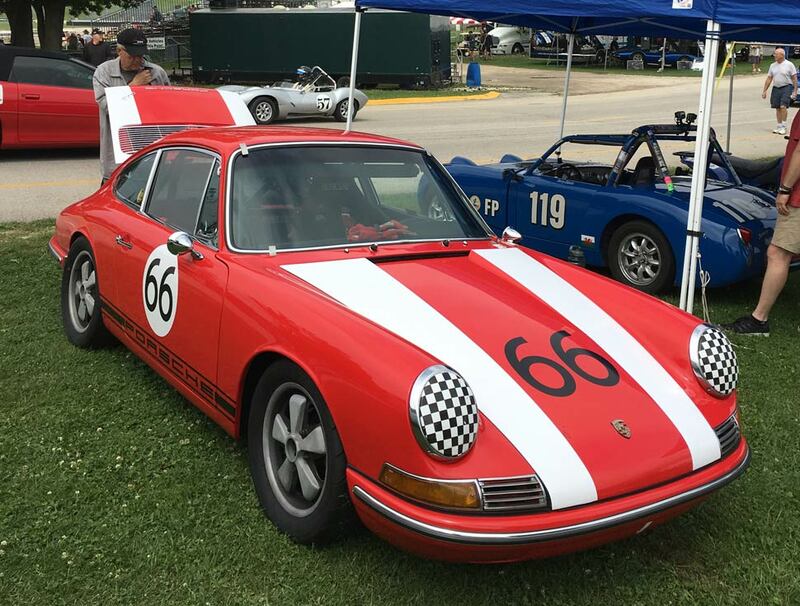 We spoke to the owner of this 1966 Porsche 912, he came up from Oklahoma City to participate, his first time driving at R.A.
Ben Robertaccio navigates Canada corner while the Gehl and the safety crew works on dislodging a Datsun 240Z from the gravel trap. 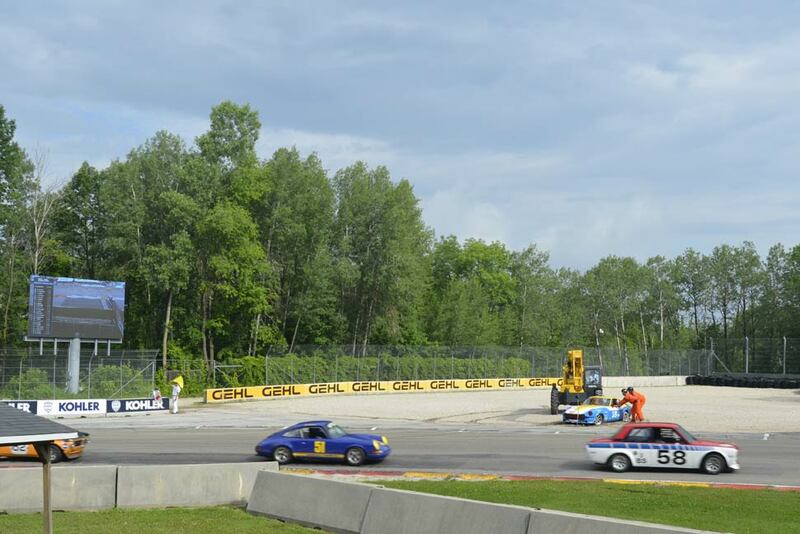 Drama at Canada Corner – as a Porsche 911 and Datsun 510 flash past a 240Z in the gravel trap. 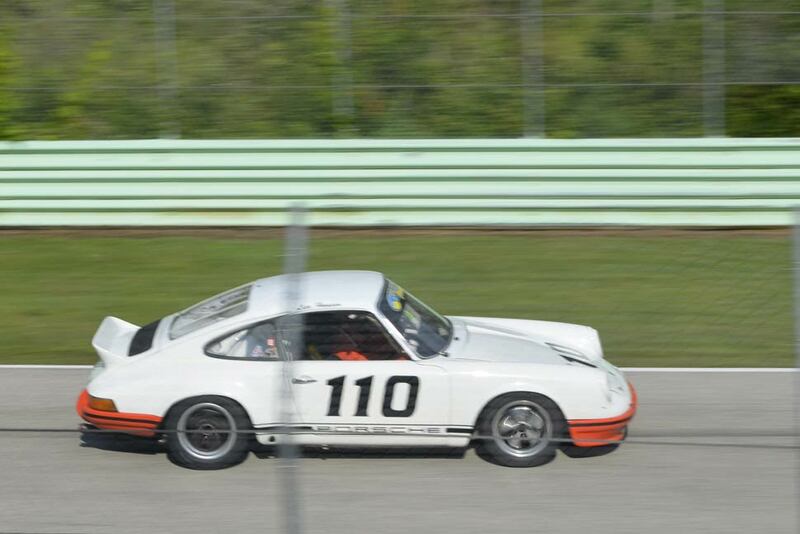 Porsche racer, Lisa Hanson, heads towards Canada Corner in her Porsche 911. 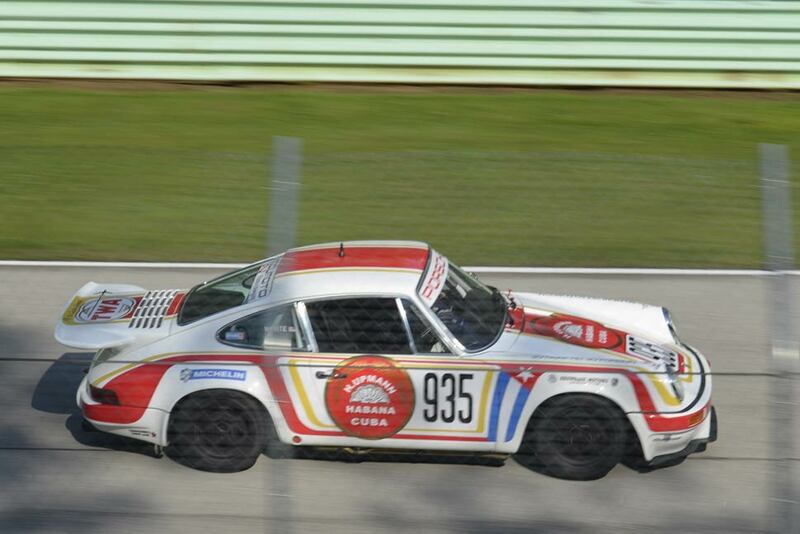 Another nice looking Porsche 911 navigates Thunder Valley on its way to Canada Corner.